All the military powers in World War II used camouflage paint schemes for their aircraft. 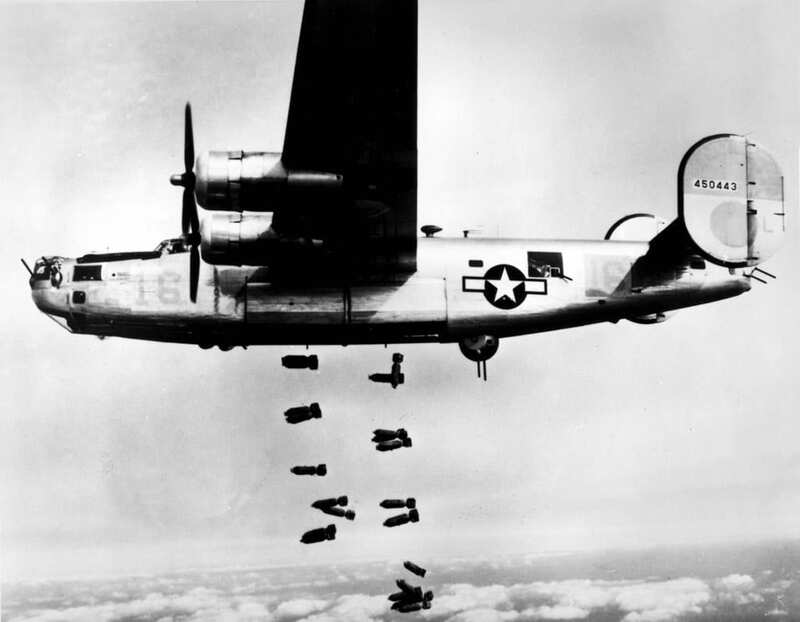 The main purpose was to help hide them when they were most vulnerable – on the ground – though it also was useful in low-level tactical operations. 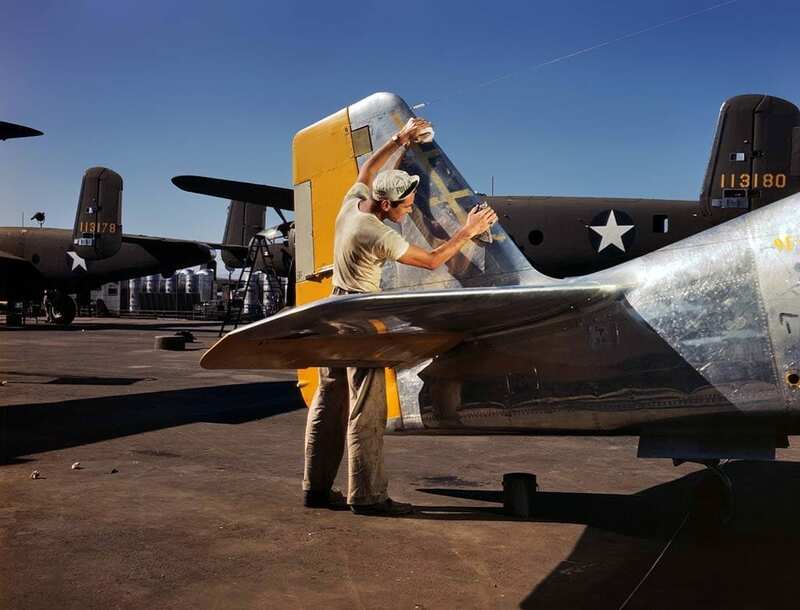 In December 1943 the War Department announced the removal of paint from “almost all” of its aircraft, with exception of some “specialized planes overseas” like night fighters and transports. As of January 1944, almost all new warplanes coming off the assembly line would only have national insignia, squadron, and plane number markings. Japan would soon make a similar decision, but its reason for doing so was a result of a scarcity of materials. The diversity (and paucity) of colors and patterns used by the combatants during the war was striking, and in some respects reflected each nation’s character. Arguably the most artistic were the aircraft camouflage patterns of the Italians. German schemes were a marvel of practical efficiency and identity addressing both the wide array of field conditions, from arctic/winter to desert, as well as the need for friend/foe recognition, both air-to-air and ground-to-air. The British (with the startling exception of using pink for their reconnaissance aircraft) utilized an understated blending of earth tones that evoked images of flowing mud. The Soviet Union attempted through its heavy-handed bureaucracy to regulate camouflage schemes, but regional climate requirements and patriotic fervor on the factory floor largely defeated that effort. The Japanese, with the exception of a jaguar-like blotch pattern, employed a flat two-color coating (one for the top, another for the bottom). American AAF and Navy camouflage paint schemes (based on the Army-Navy Aircraft, or ANA, color standard adopted in June 1943 that combined two previous standards) also tended to be two flat monotones, more a reflection of the priority placed on high volume aircraft production. AAF aircraft paint schemes were the responsibility of Materiel Command, based at Wright Field (now Wright-Patterson Air Force Base). It raised the notion of not painting AAF aircraft in November 1942 based on a study by the RAF that noted speed gains of six to eight miles an hour on an airplane with polished surfaces. In circulating its query, Materiel Command asked if the advantages of camouflage paint would be “more than offset by the last bit of ‘oomph’ in speed and climb from total elimination.” Separately, Proving Ground Command conducted its own flight experiments that same month on the subject, only with painted planes having polished surfaces, and noted speed increases of eight miles per hour. 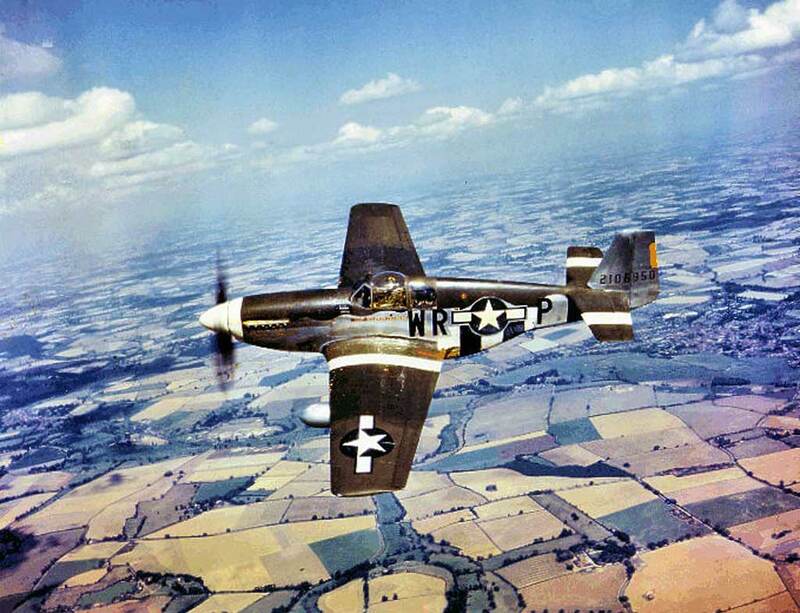 One P-51 used in the tests clocked an astonishing 21 mph increase. Examination of that fighter determined a variety of contributing factors to its speed increase, rendering its results void. Separately Proving Ground Command conducted its own flight experiments that same month on the subject, only with painted planes having polished surfaces, and noted speed increases of eight miles per hour. In early 1943, theater commander input was sought. Static commands like those in Panama registered no objection. Strategic commands in active theaters approved paint removal for heavy bombers and fighters if the tests proved out. Active combat tactical commands tended to recommend smoother surfaces or no change at all. Additional tests of unpainted aircraft confirmed increased performance results. The decision to stop factory painting unless otherwise advised on an individual basis was initiated in October 1943. By January 1944 all planes coming off the production line were not painted. Instead, they received a wax coating or were over-sprayed with a lightweight clear coat. Not only were these unpainted aircraft faster; they were also lighter. This meant increased range for fighters and bombers and extra bomb capacity for the latter. A B-17 has a surface area of 4,200 square feet and took about 35 gallons of paint to coat. If the paint weighed 10 pounds a gallon wet, after accounting for evaporation the weight would be roughly 300 pounds. Given that figure, eliminating the paint would indeed be a major weight reduction. No record exists about how much a gallon of paint used on the aircraft weighed. Contemporary reports stated that with the elimination of the paint, fighters would be “fifteen to twenty pounds lighter” and heavy bombers would “lose seventy to eighty pounds.” One recent study on the subject noted that the paint during this period was undoubtedly lead-based and “probably copper fortified.” A gallon of such paint could weigh as much as 30 pounds, though for aircraft it was more likely to be in the 10-pound range. A B-17 has a surface area of 4,200 square feet and took about 35 gallons of paint to coat. If the paint weighed 10 pounds a gallon wet, after accounting for evaporation the weight would be roughly 300 pounds. Given that figure, eliminating the paint would indeed be a major weight reduction.